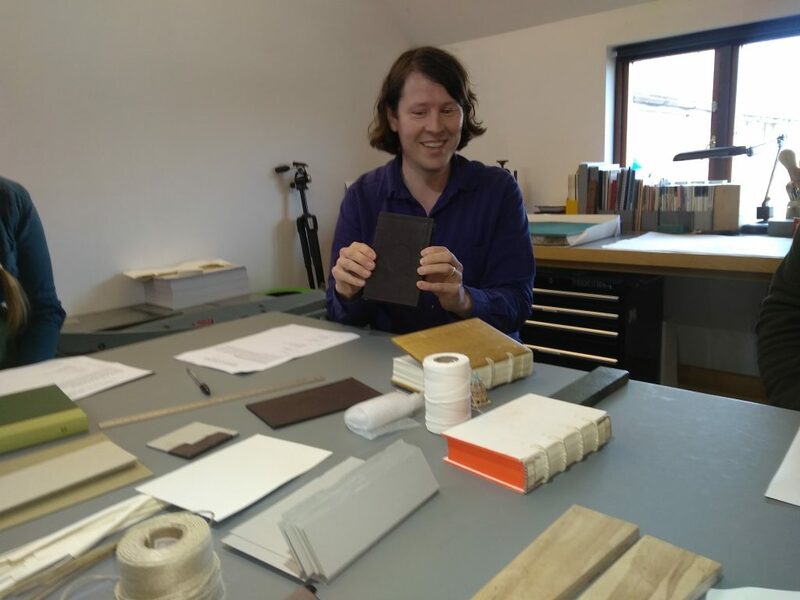 Over two days at Arthur’s studio in the Malvern Hills, five students learned to make a pulp board binding based on a design common in Oxford in the early 17th century. This transitional structure marks the movement from parchment to paper leaves and from wooden to paper/pulp boards. Common features of the structure are stub endleaves of printed waste, tawed thong supports, pulp boards, edges trimmed in-boards and coloured with vermillion, indigo headbands, and blind tooling. Our bindings had all these features making for a very busy weekend! Introduction: putting the binding in to context. Arthur had a full schedule planned, but explained and illustrated each step clearly. This was helped by his collection of period books. These books were in various states of disrepair, allowing a glimpse at the structure. Arthur is very focused on the history of the book and was keen to share his accumulated knowledge with us. He sourced or created materials that were as close as possible to those used in the original bindings. He had previously dyed linen thread indigo blue, for teaching and conservation work and generously shared his stock of this for our headbands. 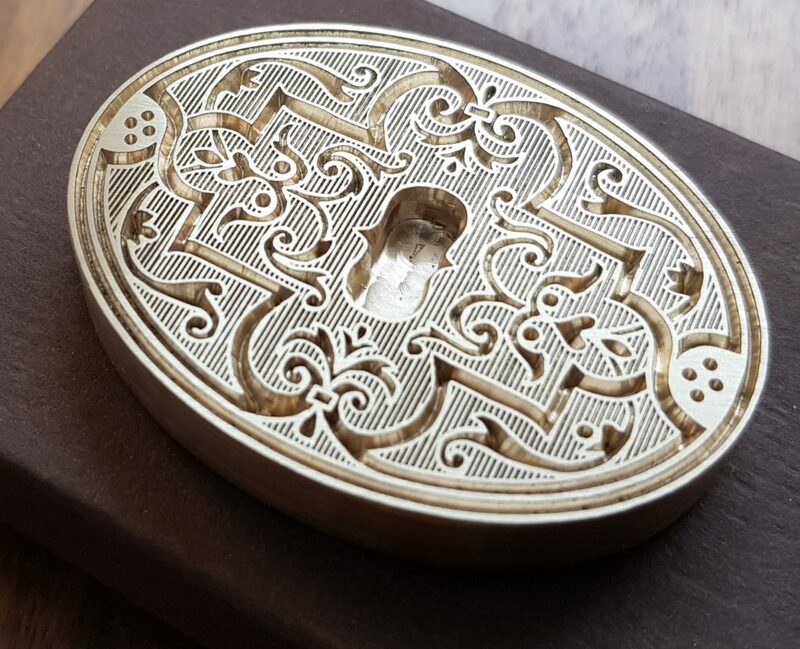 He carefully sourced an alum tawed skin that would be appropriate for our sewing supports. Everything was as authentic and correct for the period as Arthur was able to approximate or recreate for us. He spoke about techniques and tools available at the time. There were many steps and Arthur had prepared some materials ahead of time, so that we could all complete our bindings by the end of the course. 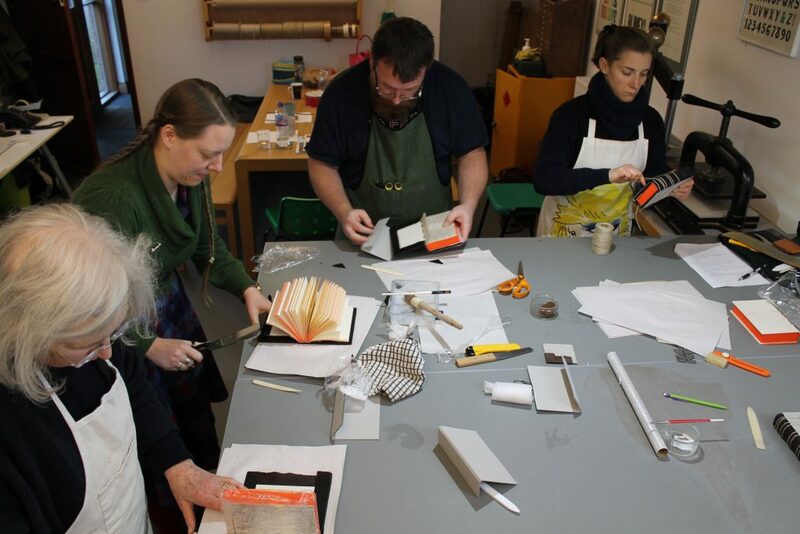 The first day included an overview of the binding we would be creating and then we began sewing. Arthur was on hand throughout and helped keep the group together so that we finished tasks almost at the same time and were then ready for the next step. By the end of the first day all our books were rounded and laced into their boards. Day two started very early for Arthur, who came in to trim all our edges, so that we could all colour them first thing and move onto the next step without feeling too rushed or anxious. Sewing endbands followed and then it was time to pare the leather. 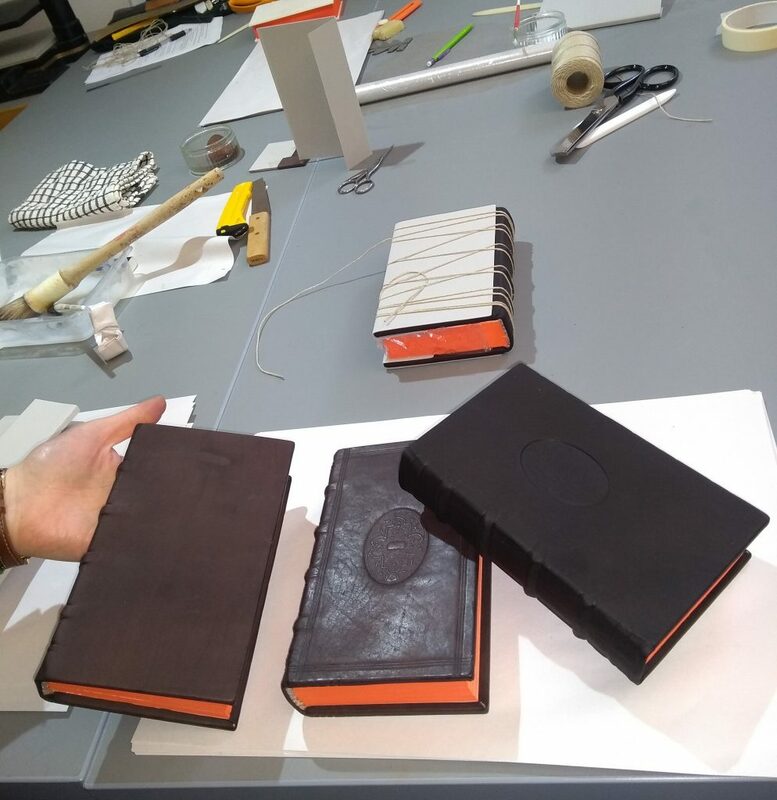 Some students had not worked with leather before and Arthur had different knives for students to sample. He spent some time talking about sharpening and paring to make sure that all the students felt comfortable with this step. 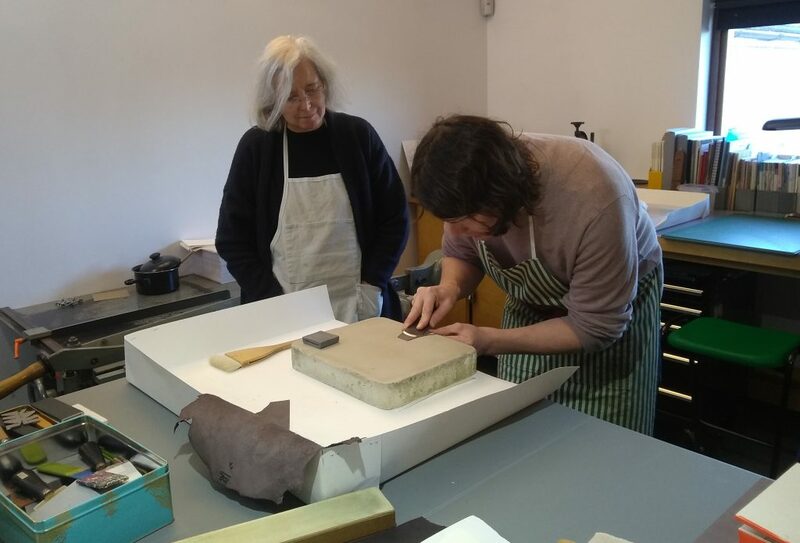 Covering the leather followed and we finished by pressing an arabesque block into the leather. Some of the completed books. True to form, Arthur had commissioned this from a rubbing taken from a 17thcentury Oxford binding. 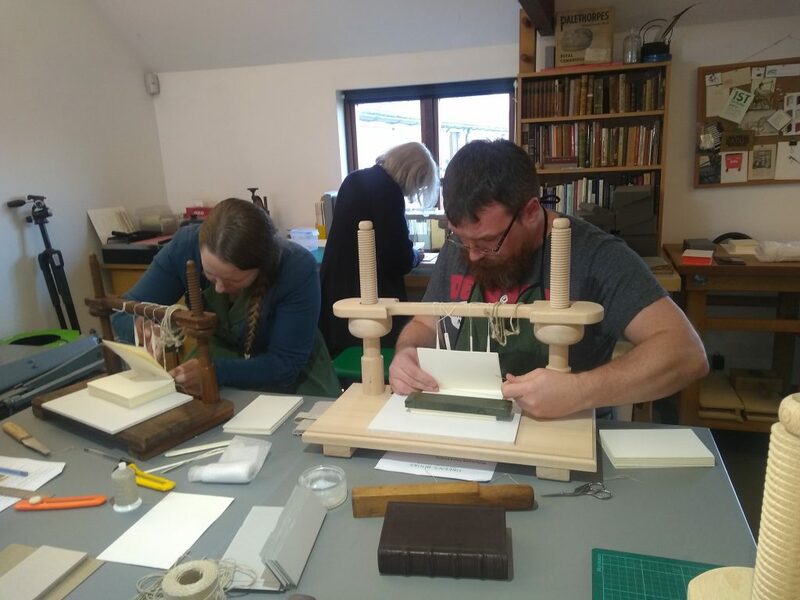 It was a wonderful course and helped us to understand the structure of this transitional binding in more detail while gaining new skills and deepening our knowledge. Thank you, Arthur!